Anglers could have less than two months to keep striped bass found in several Eastern North Carolina waterways. The State Fisheries Commission will decide on the proposed restriction next month. The requirement would prohibit both commercial and recreational anglers from keeping striped bass caught in the Tar, Pamlico, Pungo, Bay and Neuse rivers. The Division of Marine Fisheries is proposing the restriction to protect two years of naturally-spawned striped bass, said spokeswoman Patricia Smith. During the late 1980s, overfishing and pollution threatened striped bass populations. Since then, it’s become an important recreational fishery in the state, especially in northeastern North Carolina. That’s due to restoration efforts that have replenished stocks there. A restriction is already in effect for the Cape Fear River. 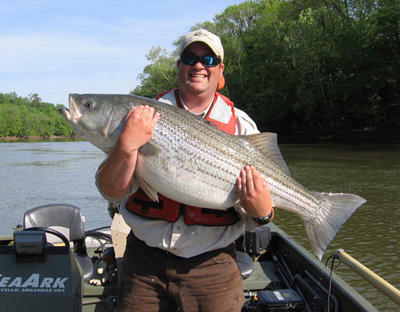 The new management measure wouldn’t affect striped bass fishing in the Atlantic Ocean, Albermarle Sound and Roanoke River. A public comment meeting is slated for January 16th at 6pm at the Department of Environmental Quality's Regional Office in Washington, said Smith. "The first question we're asking on the comments is if you support this or not... but beyond that, it's an open ended question of how does this impact you personally, and if you have other ideas on how this should be managed." Comment can be submitted online or by mail though January 23. The North Carolina Fisheries Commission is set to vote on the new no-possession requirement during their February 20-22 business meeting. If approved, the requirement would take effect no later than March 1st and be in place until Amendment 2 of the North Carolina Estuarine Striped Bass Fishery Management Plan is adopted.